Building on yesterday’s squeeze higher, as suggested in the daily commentary, this trend has continued in early trading assisted by a raft of better than expected fundamental news on the economic calendar for Europe, all of which I have covered for you on the euro to dollar site. From a technical perspective yesterday’s candle closed higher and it is interesting to note that the pair have now formed a temporary base around the 1.29 region which is providing the platform for this morning’s move higher. However, with the current price still well below all three moving averages and coupled with the breakout from the pennant that we witnessed on Monday any longer term reversal is far from certain and therefore we need to approach any trading, whether intra day or longer term, on a very cautious basis. My suggestion therefore remains the same as yesterday and is to stay out of this pair for the time being, and should the short squeeze be only a temporary move higher (which is what I suspect), then we can start to look for short positions as signalled by the chart in due course. 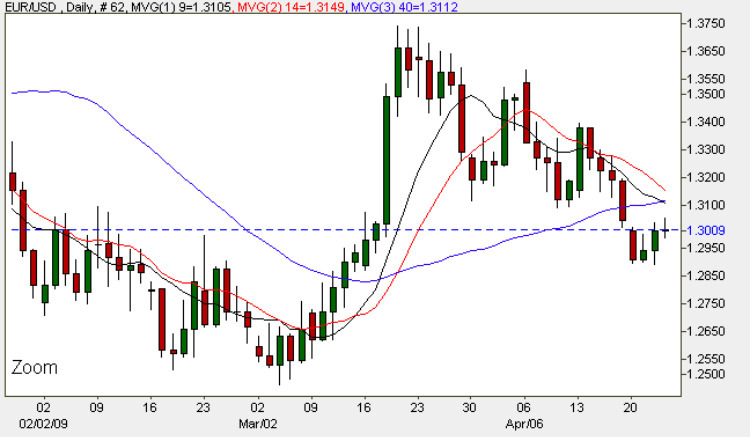 The key will be whether the current move higher is able to penetrate the resistance now in place at 1.31 and above, and any sustained move would need to see this price region broken coupled with support by all three moving averages.